Awana ministers to children aged 3 through the sixth grade. This valuable program utilizes games, Scripture memory and Bible teaching to help our children become strong followers of Christ, "approved workmen who are not ashamed". Neighborhood kids are all invited and bus and van services are available. Just call the church at 355-0949 for a ride! Please click here to print out and complete the registration form. 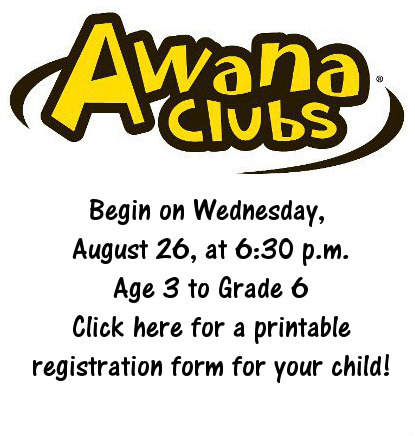 Awana begins this year on August 26. If your child is riding the bus, please review the rules and sign this form. If you have any questions, or would like to volunteer, contact Commander Janice Donaldson!